It took me quite a while to locate the shop, though they are located at Kallang Wave Mall but do not try looking for them in the mall. Exit the MRT and do not enter the mall but keep going straight, it is right at the corner. I was there on a Sunday and there was a promotion of 1-for-1 sandwich going on when you liked a particular FB page. 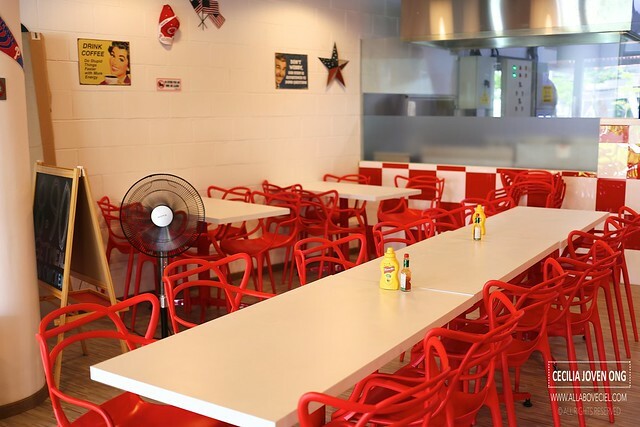 Even so, the place was almost empty with just only 1 table occupied then. 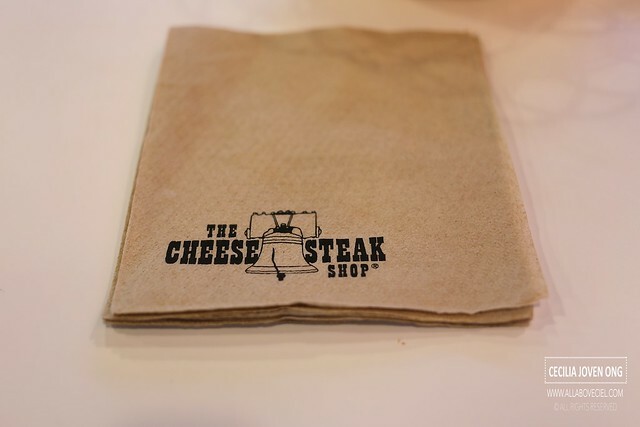 This is supposedly the franchise of the original The Cheese Steak Shop from the USA that started in 1982. While standing in front of their service counter and looking at their menu board, a service staff came over with a menu and quickly ushered me to the table just next to it. The same staff took our order at the counter later. I asked him whether i could upgrade it to a set by paying the extra. He said yes. 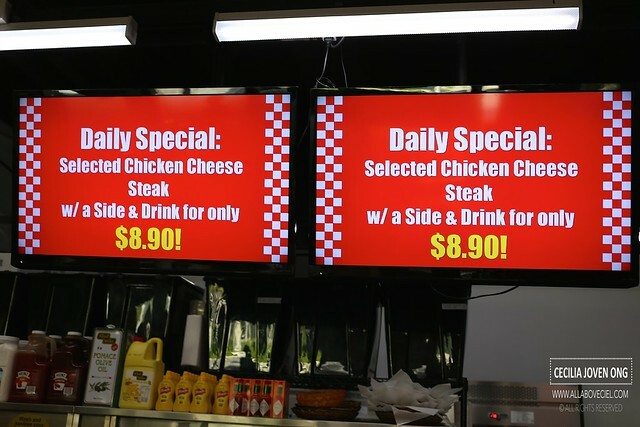 I took notice that there is a Daily Special for selected Chicken Cheese Steak with a side and drink for only $8.90. I wanted 2 sets and i should have 4 sandwiches since i have liked that particular FB page together with that particular post and shown it to the service staff. 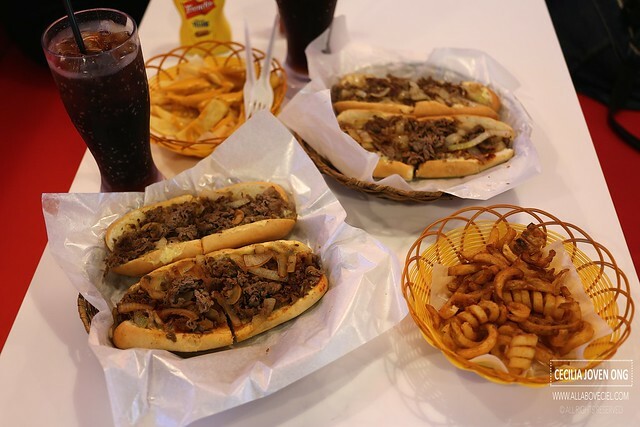 I decided to go with Deluxe Cheese Beef Steak ($10.90), Garlic Cheese Steak ($10.90), Mushroom Cheese Steak ($10.90) and Barbeque Cheese Steak ($9.90). 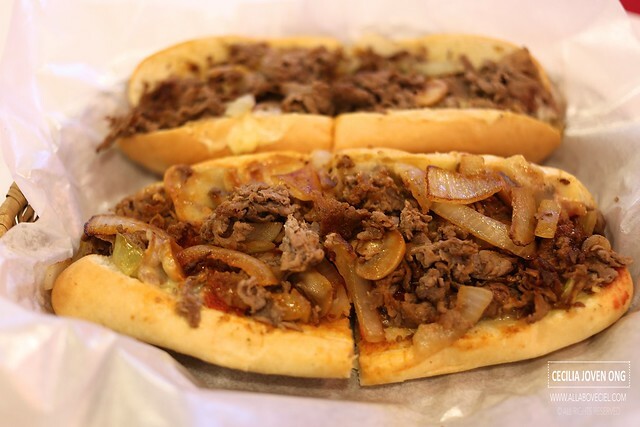 I initially wanted Steak Hoagie ($10.90) and Spinach Cheese Steak ($10.90) but i was told that some ingredients were not available at that time. As for drinks, i went with 2 large Pepsi at $2.70 each. 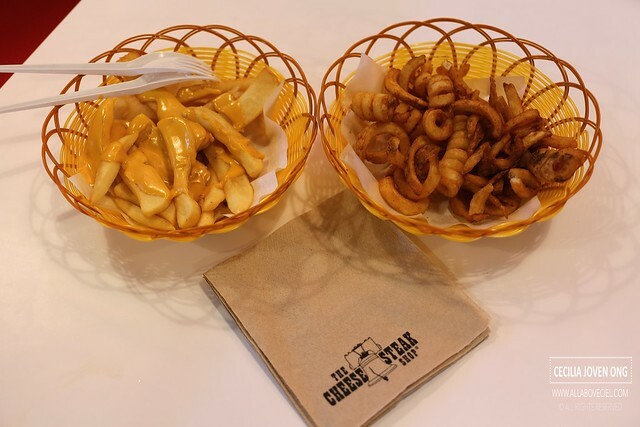 For the sides, i decided to try their Cheese Fries ($3.90) and Twister Fries ($2.90) as recommended by that service staff. The total bill came to an unexpected $34.00. When done a check, i realised the drinks and sides are not part of the set but ala-carte orders. When i questioned the service staff, he kept apologising and no explanation was given. 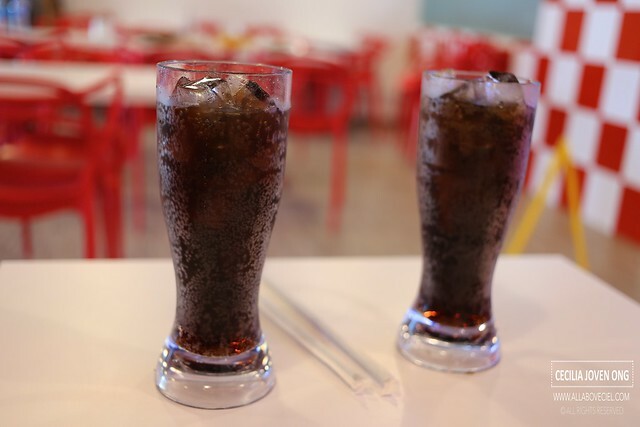 The least that he could have done is to explain why he did not include the drinks and sides as part of the set as we clearly communicated upon placing the order. He should really be honest about it even if there is no sets available for Cheese Beef Steak or the 1-for-1 promotion is only applicable for ala-carte order. This is bad customer service. The drinks came first. It was served in tall plastic cups instead of those disposable cups. 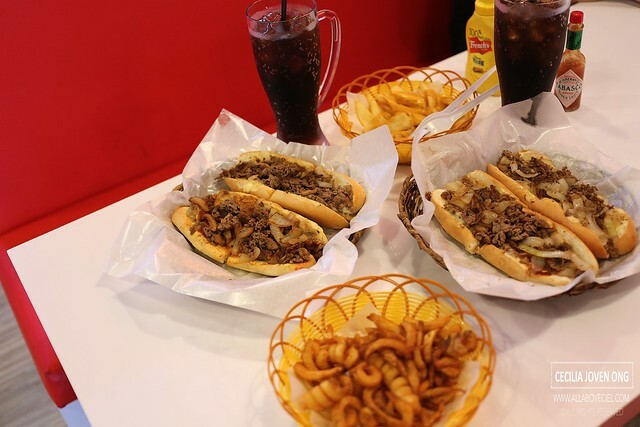 The 2 different types of fries came next followed by the 4 different types of sandwiches. The Cheese Fries and Twister Fries did not taste as special as expected. The thickly cut fries were rather soggy when left it for a bit. Those Twister Fries were just normal. You should just forget about ordering their fries. The presentation of those sandwiches was pretty shabby. 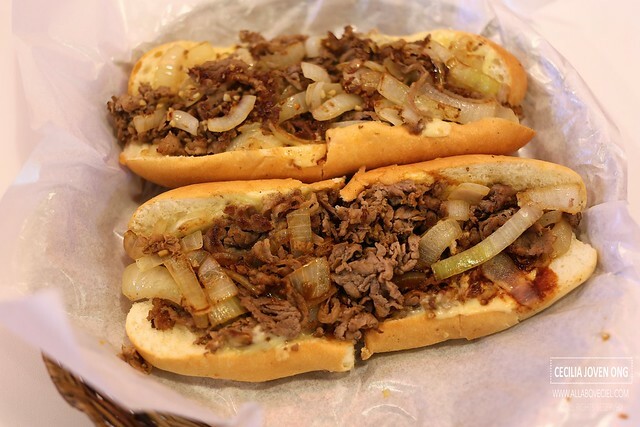 As for the beef, it looked more like beef stripes or even towards shredded beef and not those slices of beef that are expected of a proper original Philidelphia style Cheese Steak sandwich. 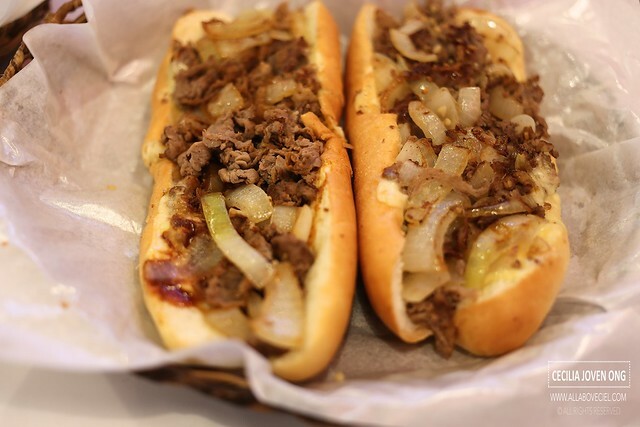 The Garlic Cheese Steak was not amongst the favourite. I felt those bits of garlic did not enhance its overall taste much thus not very special. 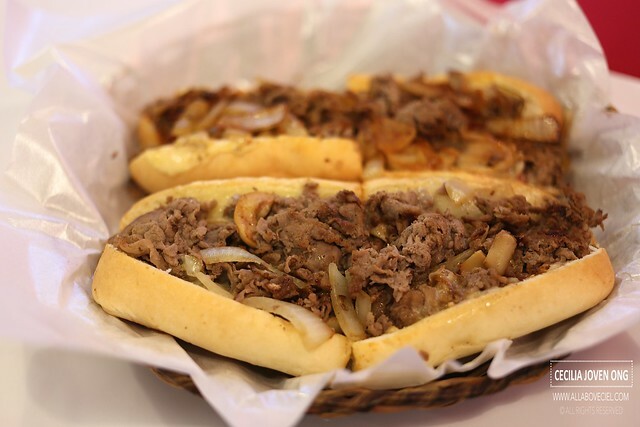 This was partly so as too little cheese was placed underneath the pile of beef stripes and slices of onion. The cheese could only be tasted at both ends but was missing in the centre part of the sandwich. 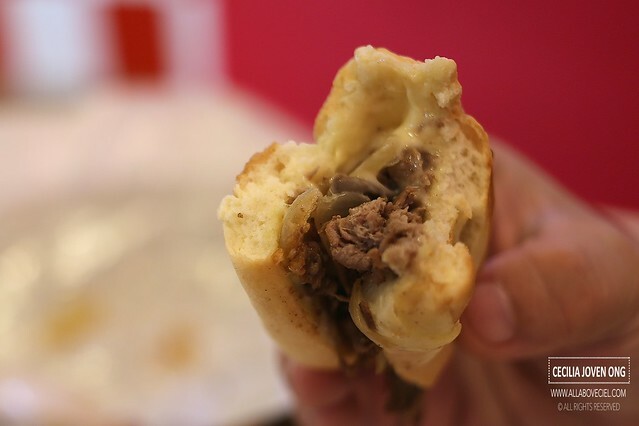 The Deluxe Cheese Steak was not the favourite too, the paste sauce was a bit overpowering and too little cheese added so very little cheese taste to the extend that you could hardly taste any and somehow reminded me of eating a pizza sandwich. The Barbeque Cheese Steak did not fare too well either, the barbeque sauce was again overpowering and with too little cheese added. 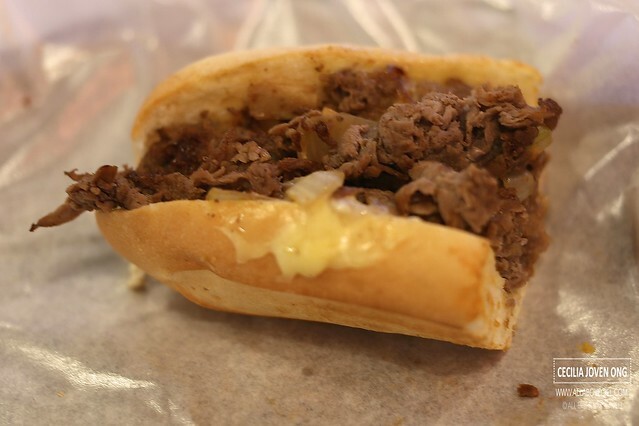 I could not help but wonder why is this even called a cheese steak when not much cheese taste is detected. 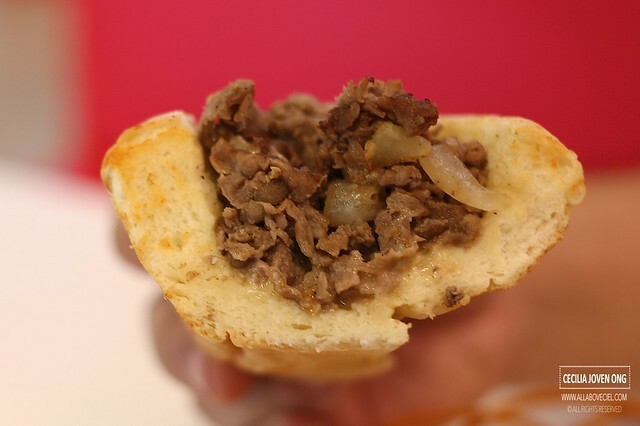 They should just called this a Barbeque Beef Steak Sandwich. 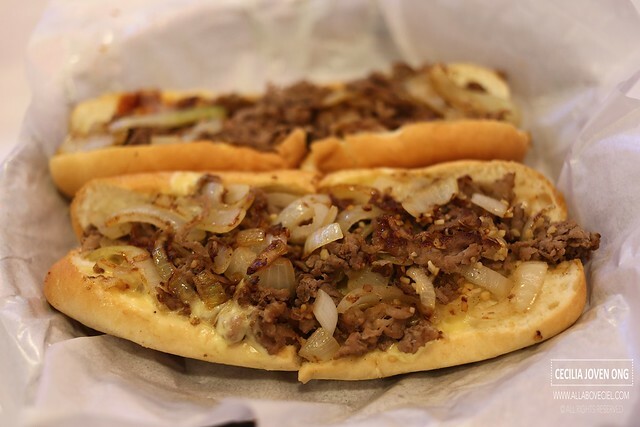 The Mushroom Cheese Steak was the better one amongst the 4 different types that i ordered, but again not much cheese taste as not enough cheese was added to be called the Cheese Steak. I have no doubt that it would definitely taste much better if more cheese could have be added and perhaps they should really do it the traditional way by placing the cheese on top rather than at the bottom. Some pictures to show the miserable bit of cheese added to the sandwich. Could you see any melted cheese in there? Where is the cheese? With such a premium price charged for the sandwich, there is absolutely no reason to have so little cheese added to each sandwich. Again, only a bit of cheese spotted at the side. 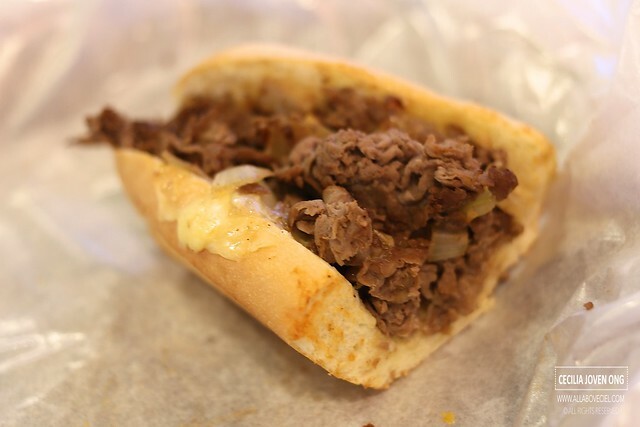 In this picture, only a bit of cheese at the end of the sandwich. 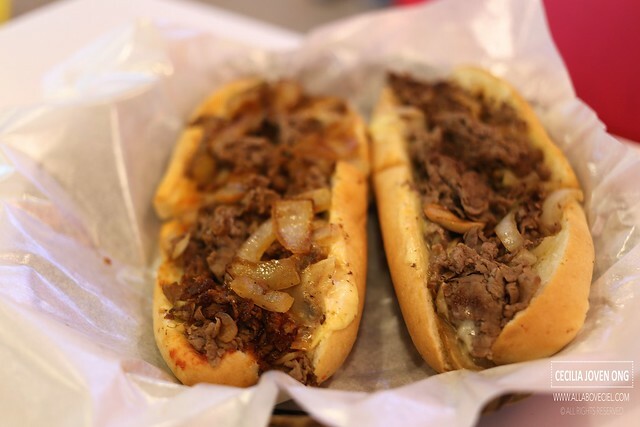 Honestly, these sandwiches do not deserve to be called Cheese Steak since too little cheese was added to make it to be one. 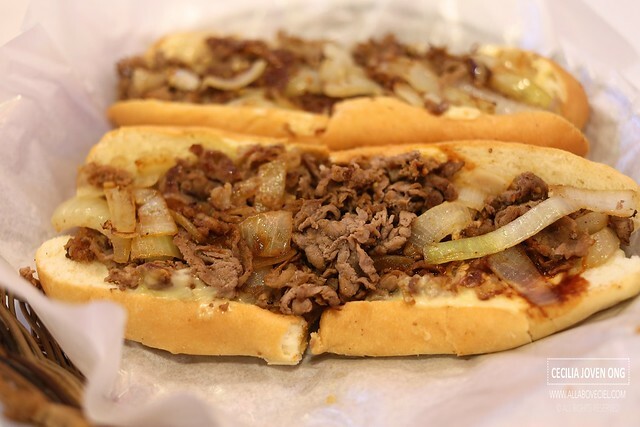 By the way, this was half of the Mushroom Cheese Steak, it was the one with the most cheese and even so, not enough was added. 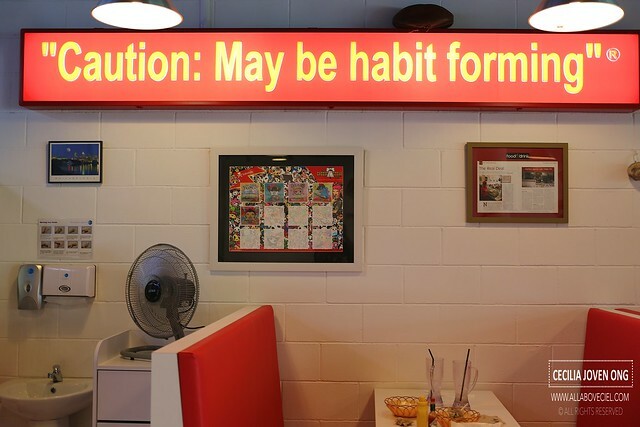 "Caution: May be habit forming". I seriously doubt so. It was just slightly after 2pm, the place was almost empty. 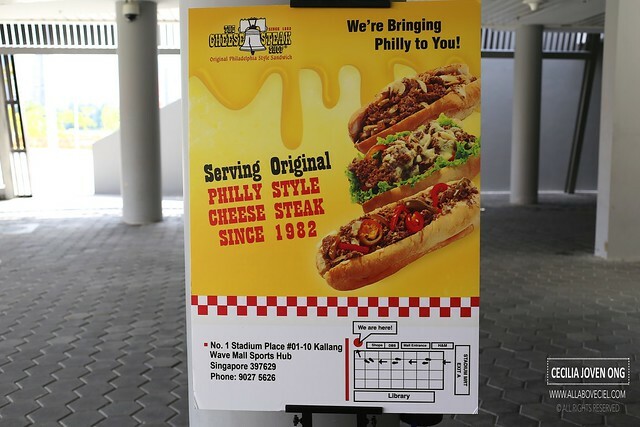 I guess most Singaporeans are not lover of Cheese Steak or maybe they shared the similar bad experience too? 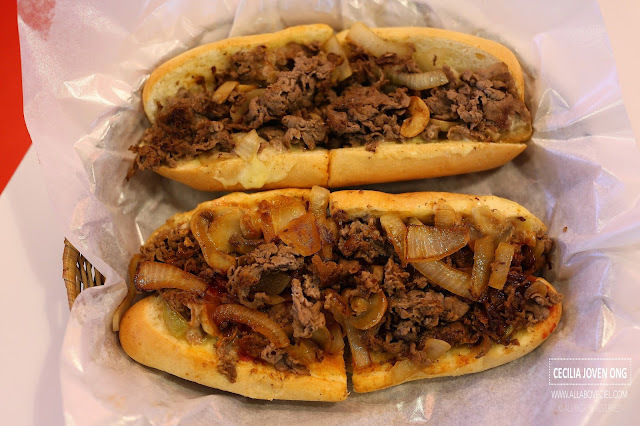 As for their tag line 'We're Bringing Philly to you", what i have tasted did not even remind me a bit of the truly great Cheese Steak that i had eaten in Philadelphia. It was an absolutely disappointing experience though i could felt the owner must have a great passion for Cheese Steak to start such a shop. 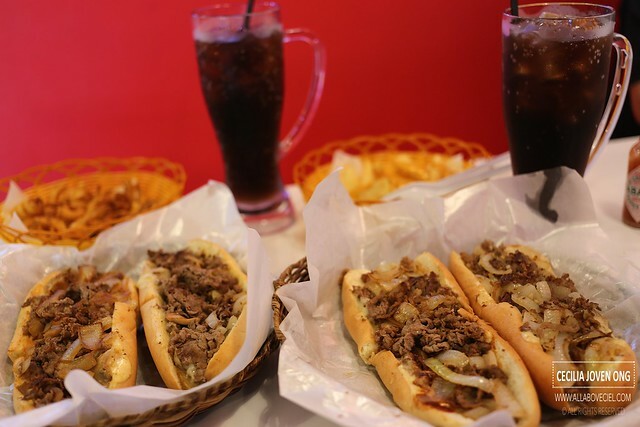 And NO, it is definitely not worth the value, i would rather go for a sandwich at one of those Subway outlets anytime. No 1 Stadium Place #01-10 Kallang Wave Mall Sports Hub SINGAPORE 397629.